"You know how people are. They think misfortune is contagious." Ah, suburbia. On the outside, it looks oh-so-normal�people gliding along well-oiled tracks, enjoying their happy marriages, 2.5 children, and healthy incomes. But behind closed doors, in the sanctity of their four-bedroom homes, an entirely different world often exists, where everyday problems seem insurmountable and private demons threaten to destroy the delicate balance they've fought so hard to create. 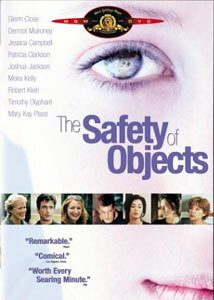 The Safety of Objects explores such a world in the extreme. I don't know about your neighborhood, but I'm hoping mine isn't anywhere near as messed up, wacked out, and downright creepy as the one writer/director Rose Troche depicts in her film. But then again, how can I (or anyone) really know for sure, when on the surface life looks so tranquil and idyllic? And that's exactly Troche's point. According to her film, an epidemic of suburban angst is raging across America, affecting different households by different degrees. But if yours (or mine) is one of the lucky few to remain immune, The Safety of Objects�through a series of unsettling, far-out events�makes us cherish our bland normality, and pray nothing ever comes along to muck it up. And that's only the beginning. As the film progresses, we discover how elements other than proximity connect this quartet of families, as Troche uses flashback fragments and probing close-ups to drop clues and interlock the story's puzzle pieces. Managing so many divergent plot threads can be tricky, but Troche seamlessly cuts between them, while piling layers onto the mystery. The result is a tightly woven fabric that, despite all the odd behavior, sustains interest throughout. In other words, the weirder things get, the tougher it is to look away. Although The Safety of Objects boasts a formidable cast, it barely caused a ripple on the radar screen when it was released in 2001. The independent nature of the film probably precluded a wide release, but I'd wager the film works better on the small screen anyway, especially when viewed in the comfy domestic confines of the family den. The Safety of Objects is an intimate movie that strikes us, literally, where we live, and watching it in the same surroundings in which the story transpires adds an uncomfortable and identifiable edge. Yet it's too bad Troche didn't bump down the film's aspect ratio just a notch, as 2.35:1 makes the movie seem too theatrical. All the actors file natural portrayals, and though their characters might not resemble the people next door, they create their own believable cul-de-sac community. Unfortunately, they're often saddled with cartoonish situations that trivialize the film's potent themes. While a sick, surreal comedy undeniably pervades suburban life, The Safety of Objects takes the idea too far, and leaves us shaking our head instead of nodding it. Image Transfer Review: MGM has fashioned a high quality anamorphic transfer, filled with vivid contrast, true colors, and accurate fleshtones. Print quality is close to pristine, yet a slight bit of grain preserves the film-like feel. Audio Transfer Review: The stereo surround track is rather weak, forcing us to strain to hear some of the dialogue. While I kept inching up the volume throughout, it never seemed to alleviate the issue. Ambient sounds come through well, although there's little opportunity for rear channel involvement. Extras Review: Only a few trailers are included. Short of spying on the folks next door, The Safety of Objects satisfies our voyeuristic needs and makes us appreciate our own mundane existence. Performances are first-rate, but the bizarre story is often hard to swallow. Still, after seeing this offbeat independent film, you'll never look at your neighbors the same way again.